I am a Registered Naturopathic Doctor and functional medicine doctor. I aim to help patients return to an optimal state of health by first understanding the underlying cause of their symptoms. Using tools from both alternative and conventional medicine we can work together on your journey. Our goal is to support both the mental and physical well being while providing individualized care. 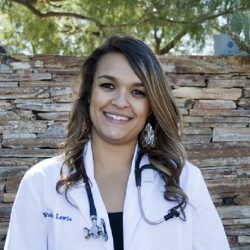 I first became interested in health while obtaining my undergraduate degree in Chemistry from Northern Arizona University. My interest in Doctors Without Borders and global health led me to learning about natural medicine. I received a doctoral degree from the Southwest College of Naturopathic Medicine in Tempe, Arizona. With my background in chemistry and biochemistry I have received further training in genomics and have a special interest in epigenetics. I have a general family practice, seeing patients of all ages with both chronic and acute concerns. I was trained in the use of supplements, herbal medicine, homeopathy, IV therapy and nutritional therapy. I also enjoy helping people on their weight loss journey and have additional training in the hCG protocol. In my free time I love to be outside- traveling, camping, hiking, snowboarding, running, and playing soccer. And I enjoy spending time with my family, namely watching my daughter grow and explore the world.